Does this look familiar? Quite often blocks start with black frames. With v2 it was necessary to select each block into preview and scroll further into it to find out what is contained in the block. Rather time consuming procedure. DvdReMake Pro v3 will analyze the video and automatically skip these blank frames so that you can immediately see what is in the block and decide whether you want to keep it or not. DvdReMake Pro v3 has completely customizable interface which you can easily tailor to your taste. Switch between 4 available User Interface Themes (2000, XP, Office 2003, Studio 2005), change appearance of the menus and layout panes with the data to suit your needs. You can even share your layouts with your friends. Studing the navigation of your disk is much easier now with "Open Destination" action. 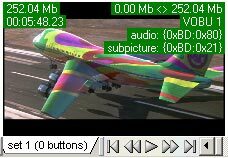 Just Ctrl+Dbl click on command, VMG title, VTS title or chapter and DvdReMake Pro v3 will take you directly to the destination. Jumping from place to place it is easy to get lost. But not with DvdReMake Pro v3. Using "Undo/Redo open destination" you can easily switch between different locations to trace how navigation of your disk works. Or you can use History pane for this. Practically everything on your DVD can be modified with DvdReMake Pro v3. Unlike v2 there is no need to start over now in case you make a mistake. Every editing step you do can be undone in DvdReMake Pro v3. DvdReMake Pro v3 has a build-in DVD player which will let you preview video, audio (MPEG and AC3 are supported) and subpicture content of the disk you are working with. No external codecs are used - DvdReMake Pro v3 is fully independant. You can download the program and run it without the need to install anything else. For compatibility reasons DvdReMake Pro v3 does not use overlays either. You can even operate the program via remote connection and still see the preview! DvdReMake Pro v3 provides you with a one click solution to merge up to 4 DVDs together preserving original disks structure (menus, extras, etc) and navigation. And of course just like during v2 development there will be more features added in minor releases which will be available absolutely FREE to registered users of DvdReMake Pro v3. Upgrade to DvdReMake Pro v3.